The MARTINI DIVA: The Last PINK MARTINI - The Pink Squirrel! The Last PINK MARTINI - The Pink Squirrel! 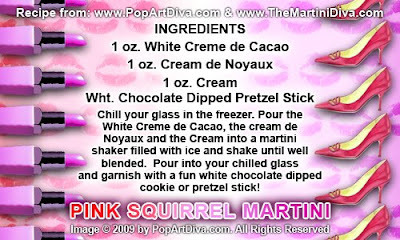 Today's is the last Pink Martini for Think Pink and it's a classic - The Pink Squirrel Martini. Based on the classic Pink Squirrel Cocktail. The Creme de Noyaux is an almond flavored liqueur made from apricot pits very much like Amaretto so if you have a hard time finding the Noyaux you can try Amaretto but it's not the same pink color!! Thanks for joining me for my Think Pink for the Cure campaign - but don't stop thinking or drinking pink - let's keep up the push to find a cure for breast cancer!